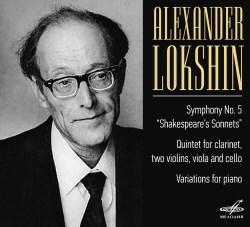 Rather than focusing down on one genre this CD takes a sample from three formats adopted by Russian composer Alexander Lokshin. Here is a composer who has not had the attention pulled in by Weinberg or Tishchenko. I am not sure why this is. Lokshin's Third Symphony - a devastatingly straight-talking setting of poems by Kipling including Danny Deever was introduced to UK audiences during the early years of Gennadi Rozhdestvensky's reign with the BBCSO. I am at a loss to understand why this work has not been recorded commercially. Better yet, let's have that BBC recording with the BBC Singers and Stephen Roberts. It's an excoriating performance of a superb work, apocalyptic and very accessible in a totally grown-up way. He wrote eleven symphonies and unusually all but the Fourth include parts for human voice. Aside from appropriating the symphony for vocal purposes Lokshin wrote other works in which the voice is prominent, including Les Fleurs du Mal and Scenes from Goethe's Faust. Bis have also recorded symphonies 5, 9 and 11 (Bis-CD-1456) but we still need a recording of No. 3. Is anyone listening? The short two-movement Symphony No. 5 (1969) is based on Shakespeare’s Sonnets 66 (Tired with all these, for restful death I cry) and 73 (That time of year thou mayst in me behold). These are sung as translated into Russian by Boris Pasternak. The words are not reproduced in any form in the booklet. The English version will be easily accessible on the internet; not so the transliterated Russian original which is sung here by Yan Kratov. Sonnet 66 is a viciously vituperative setting where resentment is plied under pressure. Sonnet 73 is for the most part a more restrained and even romantic affair - impressive in its quieter virtues and tender understatement. The harp is most artfully employed, making small gestures that add half-lit, humane and yielding dimensions. The quite short liner-notes are in Cyrillic script and English translation. They tell us that the two-movement Quintet was reckoned by the composer to be among his best. There's a resigned yet eloquent Andante sostenuto that trudges forward, harmonically rich and sweet; almost Howells but not quite. The work was premiered by Ivan Mozgovenko and the Komitas three years before this recording. It is structured not so much as a clarinet quintet with the clarinet having some sort of eminence. All five instruments contend as equals and are recorded accordingly. The composer wrote that the second and last movement Theme and Variations was influenced by Stravinsky's Dumbarton Oaks. If that is the case then Stravinsky must have had quite a light hand on Lokshin's shoulder. The writing in this second movement is of a similarly high and sustaining density to that of the first. It is almost lavishly expressionistic and the variational aspect is cross-woven and deeply subsumed. The finale arrives in a quiet interplay of pastel shades. This is deeply impressive stuff and one can understand the composer's high regard for his creation. The viola player in the Komitas Quartet was Genrikh Talalyan; the very same Talalyan who joined Rostropovich as an extra for the Borodin Quartet's famous recording of Tchaikovsky's Souvenir de Florence in 1965 (Alto ALC1295 previously Regis). The longest work here is the set of Variations for solo piano. This was completed two years before the Quintet. Odessa-born Grinberg (1908-1978) - one of the great reputations - is the dedicatee of the piece and was the first to perform it and to record it. Lokshin must have been blown away. In this case the variation pattern is far more transparently discernible than in the second movement of the Quintet. It's a torridly challenging endeavour, full of the sort of engagement for ear and mind experienced in the Shostakovich Preludes and Fugues which Grinberg also recorded. The whole work breathes earnestly breathtaking excitement and must be a sore technical and artistic test for any pianist. It ends with considerable emotional force in the indomitable stumblingly marching style found in the first movement of the Quintet. The Variations have that equipoise of gravitas and limpid invention that would surely have the work appealing to Ronald Stevenson and Murray McLachlan. Grinberg's legacy has been documented on Vista Vera and Denon. A distinguished disc, bringing to our ears honestly-cut analogue recordings that cut a cross-section through the genres embraced by Lokshin.